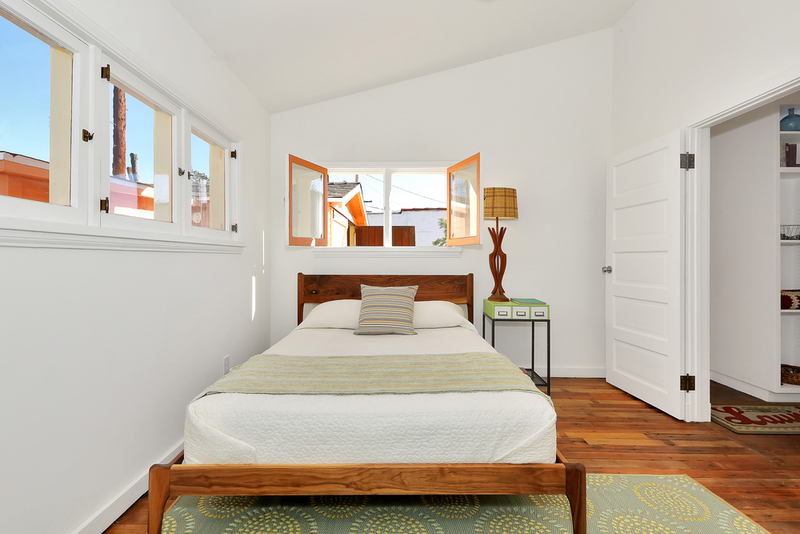 This 1925 California Bungalow that has been restored, expanded and thoroughly reimagined. This conscientious home makes the most of its space in ways that are clever and surprising, including an overhead loft, stowaway bed, and a wall that disappears with the touch of a button. Located on a tree-lined street in Atwater Village, the house had stood in a seemingly “untouched” state for a great many years. It presented and a huge challenge for ReInhabit, which was to enlarge and modernize the residence while preserving its intrinsic charm. Expanding the footprint by over 500 square feet was only the start, and required the team of designers, architects and craftsman to add a new network of systems including foundation, roof, plumbing, electrical, sewer, central heat & air and a tankless water heater. They preserved or repaired whatever they could, including much of the original siding, windows and doors. Since they were growing the house, essentially doubling its volume, materials had to be added. 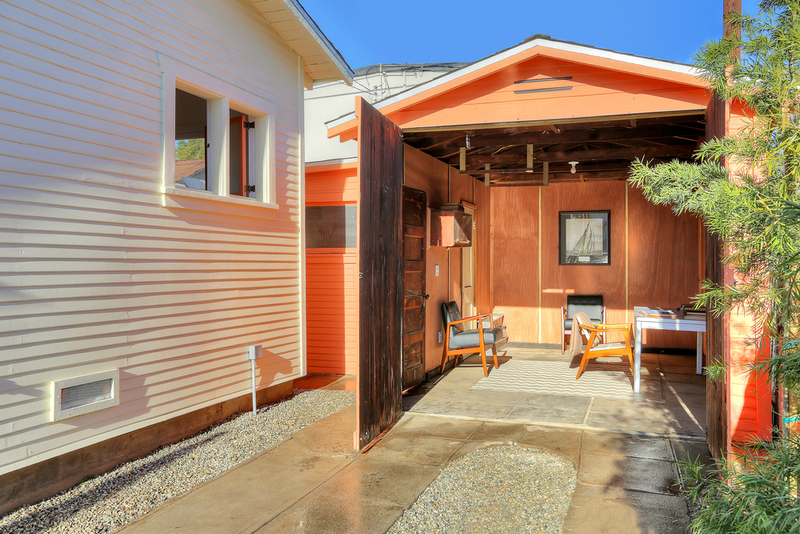 Not content to simply “build new,” ReInhabit found things from other places, like the front porch Redwood that was once part of a West LA music studio, and the wine-barrel planks that add texture and gorgeous patina to the gable. A Murphy bed that was native to the home has been restored and put back into use. Wood flooring in the living room and Master Bedroom come from Downtown LA’s Silverado Salvage, and refurbished lighting has been procured from M & M Electric of Pomona. These vintage elements look great and add quality and character to the home, complementing modern amenities like the open floor plan and walk-in closet. From an old commercial building, ReInhabit recovered an automatic roll-up door, installing it as a section of wall along the main portion of the house. With the simple touch of a button the outdoors come inside, showering the living, dining and kitchen areas in daylight or evening as they join seamlessly to a newly-made deck. This is the ideal place for morning coffee or drinks with friends. For dinner parties, an edible landscape is available right out front, in professionally-installed planter boxes. And for the ultimate conversation piece, the kitchen where you will prepare those meals features hand-finished cabinets painted by an established artist known as Fuse. 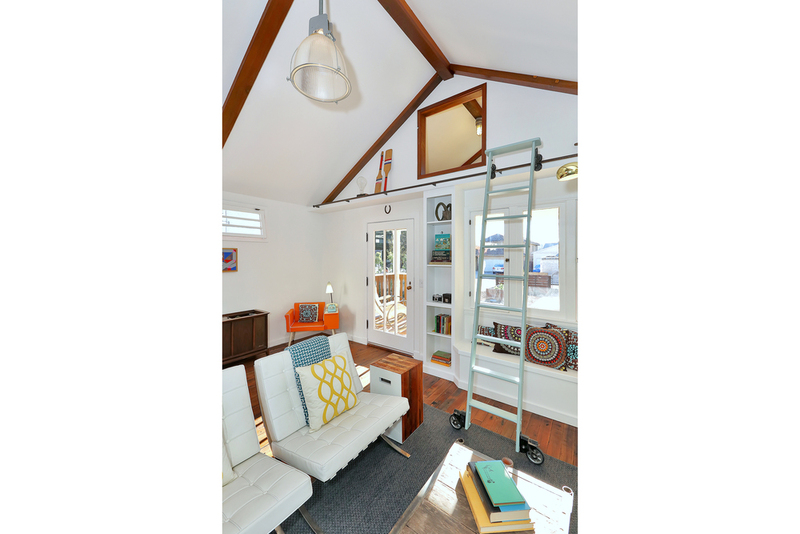 With a garage and bonus room that could serve as your office or creative space, this home serves as ReInhabit’s case-study in expanded living with an eco-friendly footprint. It is also very well-situated, with easy access to the shopping, dining and night life of Atwater Village and its neighboring communities.